October 2015 – Great Venture Surf Co.
Last week we treated ourselves to two of London’s most renowned steak restaurants Gaucho and Flat Iron. Two steak joints, two very different experiences and here is our quick, to the point reviews. We’ll start with Gaucho as we went there first. Wednesday at 12:30 at the Charlotte Street restaurant was a little quiet, but we didn’t mind; we got the a nice feel from the place. 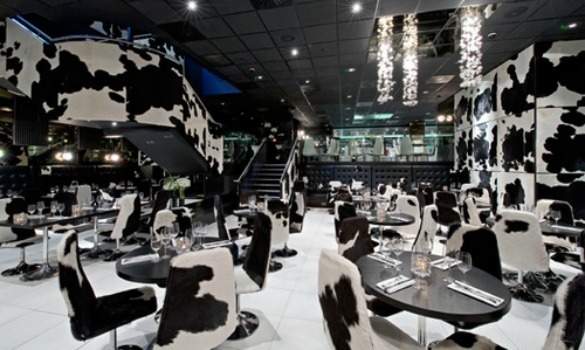 The unmistakable cow print fur walls and glass walkways gives this particular restaurant a retro vibe, but nothing about the service or food was retro. We sat down and were brilliantly waited on, the waiter explained the selection of steak and suggested how each should be cooked. Three quick decision later, we ordered three sirloins, two with Peppercorn and one with Bearnaise. To go with the three 400 gram steaks we had cream spinach, chips and veg, to drink three German Red Ales. The steaks were cooked to perfection, plump, juicy and tender; the spinach was the highlight of the sides and finally the Ale topped it all off. Not a lick was left on the plates. We paid the bill, perhaps a wee bit high, but we expected that and left feeling satisfied and full. How did this compare with our Thursday night at Flat Iron? Thursday night came about and we were at Flat Iron on Beak Street. We waited for 1:45mins for a table, not a problem, a few pints in the Sun and 13 Cantons and the time flew. We were with our friends Nile, Dave and Claire (Dave and Claire had recently gotten engaged) so in fine company. We all went with the steak, sides of spinach, chips, salad and roasted veg. The menu is simple, to the point and brilliant. The steaks arrived pre cut, with the sauce of your choice, the sides arrived in small, trendy tin dishes with enough in so you’re not feeling scammed. To drink Red Wine – keep it coming please! Brilliant steak. Nothing more to say. They’re not a big as the sirloins in Gaucho, but pound for pound my honest opinion is your getting more for you money. I mean £10 for a steak, who can argue? All this is made even better by the novelty of eating with a mini cleaver. The sides were brilliantly filling and all in all an awesome experience. So to conclude both great steak restaurants, but if you’re looking for a relaxed decent evening out… Flat Iron gets our vote. Boardmasters – the video edit! Whilst at Boardmasters we met loads of cool people and got to speak to them about their amazing brands. We thought it would be nice to give them a little shout out on here, so that you guys can look them up too! Boardmasters – GVS Co Style! It feels like an absolute age since we went to Boardmasters and when we came back, exhausted, cold but very happy! It certainly was very different to any festival we had been to over the years but in many ways that was what made it so good! First of all I think it is good to point out that Boardmasters, unlike most festivals is split over two completely separate locations. The music festival is at Watergate bay and the surf festival is at Fistral bay. Now for you to get to each location you need to either walk for around an hour or you can get on the festival shuttle bus. This cost £5 return and can take quite a while because the traffic in Newquay for the duration of the festival is bumper to bumper. That being said, if you grab a couple of beers and jump on the bus, the time flies by and it is super handy that it runs till 4am in the morning. This means you are able to get back if you decide to party in town. The point – dance stage, which lets you have a rave whilst looking out over the coast. The view – this stage is where all the up and coming acts play. This year they all palyed out of the side of a metal camper van – it was ace! Jack Daniels Tent – this was a stage that was actually down at Fistral beach, but it was great dancing away in this tent whilst being right on the beach. Take swimwear and a towel, this way you can catch a few waves, should the weather bring some decent swells. Daisy Clarke – a young extremely talented lady from Cornwall who writes and performs her lovely acoustic tunes along with some pretty mind blowing covers! Acts like this are why we love festivals, one minute you are just chilling by a stage, not knowing what who was coming on next and then you end up hearing someone that you listen to constantly when you get home! The Land of the Giants – An absolutely dynamite group who perform their own songs and also some cover versions. They are a ska/rocky/poppy explosion of fun! Again we stumbled across this band and were blown away by their energy and ended up dancing away to their whole set and chatting away to the lead singer for ages afterwards. Rag ‘n’ Bone Man – This guy has possibly the biggest voice we have ever heard! He was much rockier than any of the other two bands we mentioned but his songs, his persona and his sound really got us hooked from the minute he opened his mouth! We have included links to all of their pages, you just need to click on their names and you can give them a listen – you wont regret it!